Yesterday, I was going through various recipe blogs. I stopped by Malar Gandhi's Kitchen Tantra, where I saw an announcement for the event "KitchenMishaps" . This is really an interesting event and I'm sure everyone of us would have some story to share. My very first kitchen mishap happened during my school days. One day, my mom had gone to a hospital to help one of our relatives in emergency. My dad said he would order food from a restaurant nearby but I didnt really appreciate his idea. I told him that I would cook him a lovely meal (What a confidence!!) I entered our kitchen for the first time and prepared the easiest dish on the earth "Rasam". Only during lunch, I realised that the rasam tasted so horrible and we couldn't eat even a single spoon of rice. You guess, how I prepared rasam? I just boiled tamarind juice with some salt and lots of chilly...As I was new to kitchen,I didn't know about the spices to be added or the ratios for the ingredients..just couldn't forget my first recipe!!! 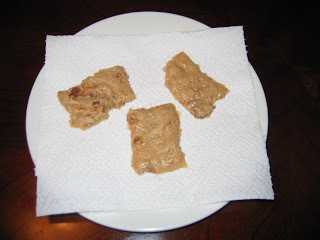 Two years back, I tried out a Kaju Katli recipe that I read in some magazine. Hopefully, I followed all the steps. Actually, in the final step, the contents had to be poured on to a ghee greased tray/plate and should be cut in to pieces once they start to soldify. I was waiting for the contents to get hardened and alas! it never happened. Even tried putting inside the refrigerator, still nothing happened. I didn't want to throw it to a bin, so I added some more ghee, milk,scraped coconut and fried almond pieces. Cooked over stove top for few minutes and served hot. I told my family that at the last moment, I changed my mind and made Cashew Halwa!!! ( I know,no one believed this!!).. hey,yeah forgot to tell you about the taste..it tasted good (No one said so..it is ok..I know that myself..hehehe!!) except for that sticky nature!!! Last month, again I did try to make some Kaju Katli and guess,what? this time I managed to cut it in to pieces (Please don't ask about the shape, see it yourself!!) but it was bit hard to bite (hey,believe me...I have nothing to do with my hubby's last month visit to a Dental clinic!). The unevenly shaped hard to bite Kaju Katli ! 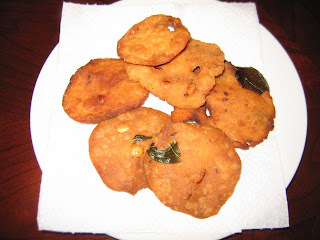 The another one is, during this October, I started to prepare "Kai Murukku" but finally ended with thattai. The actual story and the recipe goes here. Kai Murukku turned in to Thattai! The latest mishap is, I kept jaggery and water in a pan in stove for making one new variety sweet. I realised something gone wrong only when the house was full of smoke. Everything that was on the pan totally got charred and finally, I had to throw away everything including the pan to the bin. Somehow, a disaster was averted but nowadays, I'm trying to be more careful while in kitchen. Although, the mishaps at kitchen are at times funny they always teaches us some lesson every time. Thanks for your entry, I really appreciate it.